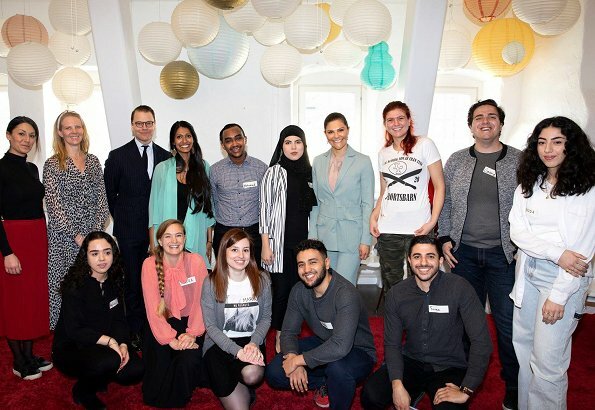 On April 2, 2019, Tuesday, Crown Princess Victoria and Prince Daniel of Sweden visited The Good Talents project in Botkyrka, which gives training and workshops in leadership and entrepreneurship. The Crown Princess couple were welcomed by Sandra Kinnaman Nordström and Gayathri Rathinavelu who are the founders of The Good Talents project. The project was launched in 2012. 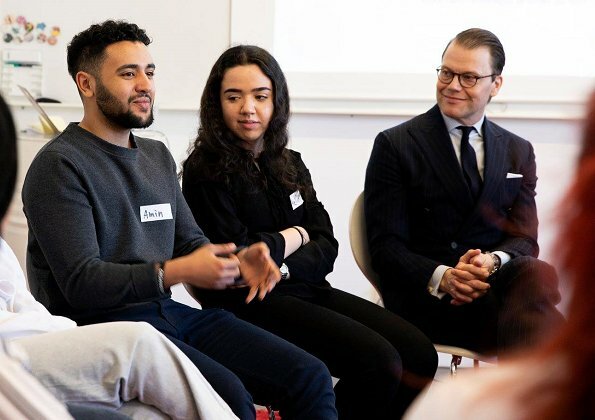 The Good Talents identifies young talents in the suburbs of Stockholm, who all have business or project ideas that solve local challenges. The project gives training to these talents in sustainable development, social entrepreneurship and leadership. Like the peach coat and the colour of the suit. Still not a great fan of the suit itself. Isn't Daniel handsome? They are such a lovely couple. Oh, the fit of these trousers compared to the dark green ones of the other day is MUCH better. I think a patterned sweater or blouse would look more interesting under the jacket rather than the everlasting tie shirt. Nice spring outfit, but it would have been great to see CP Victoria with another less tight hairstyle for a change! Has she curls like Prince Carl Philip, who "hides" them (with wax)? I wish she had not worn the jacket at all. The cut of these pants are much more flattering than those of her green suit. Now if she would just invest in some younger, less formal blouses. I prefer the dark green suit of the other day. She has the figure to pull it off with more fitting trousers. These trousers are almost tent-like... But her lovely smile is the most important thing! Their honest cordiality and their commitment are very special. I´m not a fan of the green suit. She can do by far much better. Victoria is probably the one royalty who re-uses her clothes the most. This suit is one of the clothes she has worn quite a lot, unfortunately it is not very intersting or flattering. The blouse is just ugly. I would like to see them in a more relaxed dresscode at this kind of event. Moche de chez moche,et si ça ne suffisait pas ceinture inutile et trop large .